Facebook has made official announcement on offering Vanity custom URLs to every facebook user. Instead of random “id=592952074” thing in Facebook URL, see your name to directly dump into your Facebook profile. This looks neat, easy to remember and sharing Facebook profile URL with friends. This will also throw up your Facebook URL in search if someone searched for assigned username. 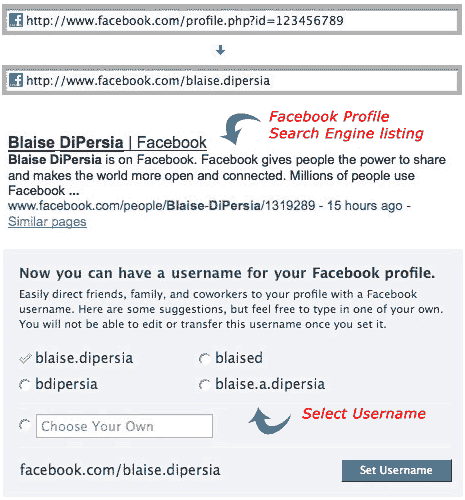 It will show options based on your actual name in Facebook profile or you can chose any other username. Your username may contain alphanumeric characters (A-Z, 0-9) or a period or full stop (“.”). Once you select a username, you cannot change or transfer it (so, be careful). If you think, “why the hell use this to make Facebook profile public that can be leeched by search engines?” – well, you can chose cool looking username and still keep away from search engine listing. using privacy settings. Grab your vanity URL Facebook username for easy looks, sharing and searchable (if you want that!). P.S. If you signed up for a Facebook Page after May 31 or a user profile after today at 3 p.m. EDT, you may not be able to sign up for a username immediately to prevent abuse or “squatting” on names.